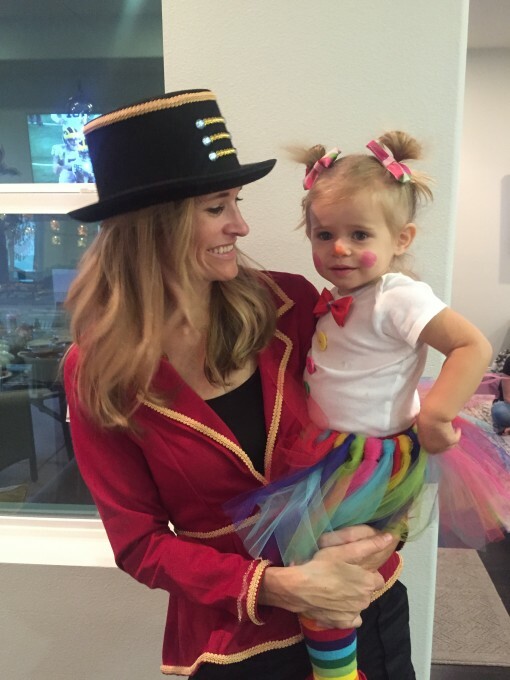 It was a fun Halloween with Charlotte being 1 1/2. As always, we had to do a theme with our costumes. 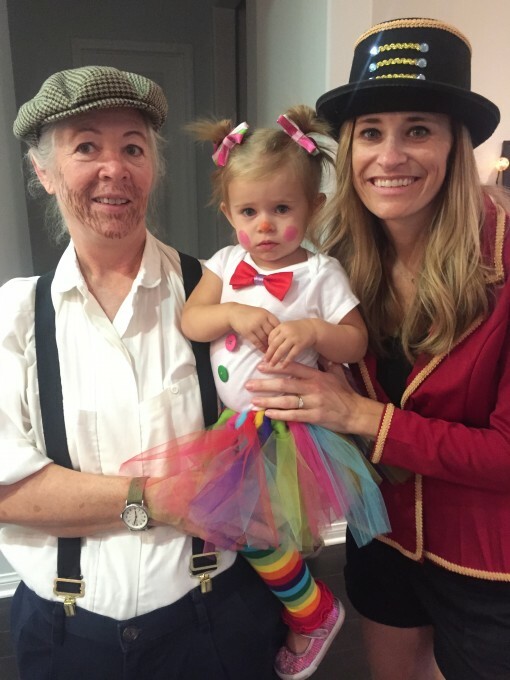 This year, our theme was the circus (last year can be seen here). 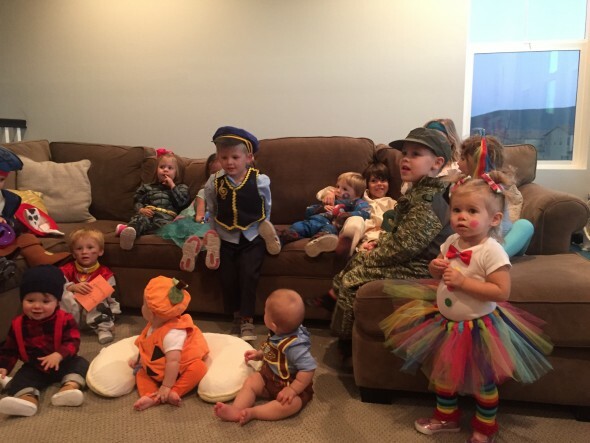 Unfortunately, at the last minute, Matt decided he didn’t want to dress up… I don’t entirely blame him since none of the other adults dress up. He was going to be Strong Man and I had even made him this really cool barbell prop. 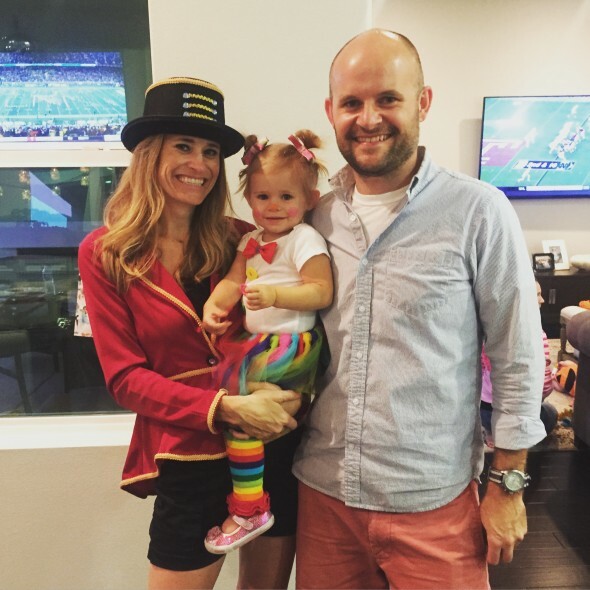 Charlotte dressed up as a Clown and I dressed up as a Lion Tamer. I ordered suspenders for her costume a couple months ago and she went bananas when I put them on her, so I decided to loosely sew ribbon on her onesie to make it look like suspenders. She still went bananas when I put her onesie on, so I ended up having to cut them off and bribe her with a ton of yogurt melts. 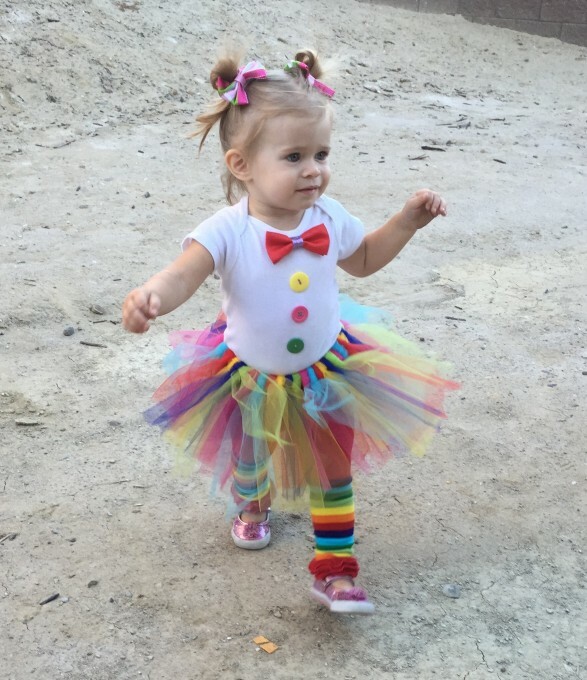 One day she’ll regret throwing a fit over suspenders- they really made the costume in my opinion. For the tutu, we put it on her right when we got to the party so she was quickly distracted by other people and the doggie. We headed to our friends house for a little pre-trick-or-treating party. 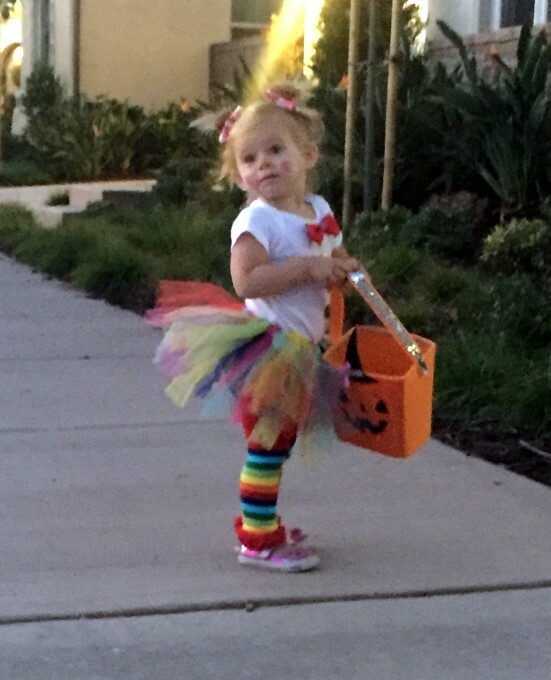 Charlotte was the youngest in the bunch (who could walk), so trick or treating was a little challenging. All the kids were running from house to house and she was consistently 3 houses behind inspecting what was just put in her basket. We had practiced saying “trick or treat” (her version was “chee chee”), but once she got to the door, she would freeze and just stare at the person. No chee chee, no thank you, just a blank stare. 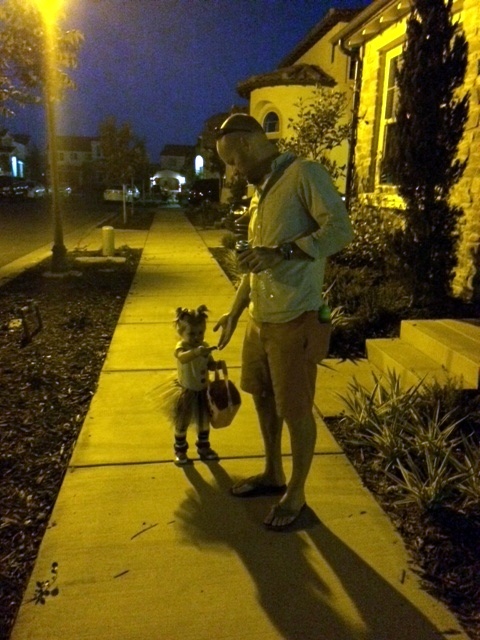 She was very interested in the candy in her bag though… she had to inspect every piece. 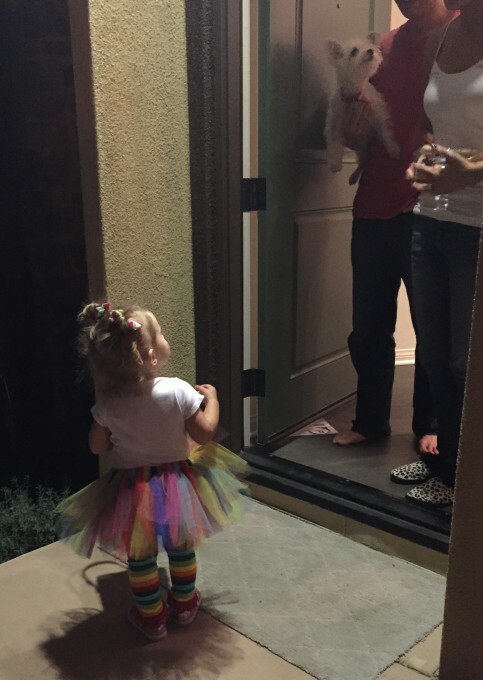 It was such a fun experience to watch her trick-or-treat for the first time. I’m already looking forward to next year when she understands it even more!